Feeding Puppies, Are You Feeding Healthy? Feeding puppies is different from feeding adult dogs puppies have special nutritional requirements. The first year is critical to development. During this time they need the best possible nutrition for strong bones and teeth, proper development of body functions, clear eyes and a thick, lustrous coat. At 6 to 8 weeks of age a puppy needs 3 times the adult caloric requirement per pound of body weight. This reduces to 2 times the requirement by the time the puppy is 16 weeks old. This caloric requirements decreases gradually over time and varies by the breed. Many breeds complete growth and development in approx. one year, some take as long as 2 years. We don’t wean our puppies completely until they are at least 8 weeks old. Puppies who are weaned too early have a rougher time adjusting and may be at risk for illness or other problems. A puppies digestive system is not yet ready to process whole foods, feeding puppies before they reach the age of 8 weeks and some of the smaller ones, runts for example, should be held back even longer. They receive the essential nutrients and antibodies that mothers milk provides. You can start to slowly introduce whole foods at 6 weeks, watch them closely for any digestive problem. Slowly work up to 3-4 times a day. Keep in mind individual puppies may differ, even from the same litter; you may have to separate them to keep a closer watch. Between 6-8 weeks feed puppies 3-4 times a day with a well balanced puppy food, make sure meat is the first ingredient on the can. After 8 weeks you can cut this back to twice a day. From 6 mo to 1 year he may look grown but he's still a puppy, so keep the extra nutrients provided by puppy food. Somewhere around 8-9 months switch his feeding schedule to once a day, but check with your vet first. Follow the directions on the label when feeding puppies. If you are feeding multiple meals, divide the daily amount accordingly. For my Chihuahuas up to 10lbs I feed 1/3 - 1 cup dry food and I mix this with 1/4 to 3/4 cup can food. Its very important to not overfed your puppy/dog, obesity is very dangerous for any dog but most dangerous for the smaller breeds such as chihuahuas. You can give your dog table scraps, provided that they are low in fat and sugar, but treats developed for dogs are a much better choice. When feeding puppies make sure that treats or table scraps do not comprise more than 10% of their total diet. Look out for this though, because you may be setting yourself up for a behavior problem by feeding table scraps, you'll typically have a lifelong "beggar" at your table whenever you eat. Another behavior problem you may be developing, feeding puppies table scraps may encourage them to steal food left on an unattended table- some of which could be hazardous to your dog's health. Whether your feeding your puppies free-choice (providing a constant food supply throughout the day) depends on them. If your pet is a "nibbler", Chihuahuas and other Toy Breeds typically are, you can put out the day's ration and let her eat it throughout the day. Now, don't just fill the bowl whenever it becomes empty, or your pet will probably overeat, and if you are feeding multiple dogs as I do, you will find it difficult to tell if one "goes off feed" (is not eating well). Its important when feeding puppies to feed the same kind of food everyday, slowly transition food changes, or you may end up with a case of diarrhea. Which is definitely NO FUN! When feeding puppies keep in mind some can gulp an entire bowl of food down in a just a few seconds. This can cause stomach and digestive system problems, because the animal takes in large amounts of air with the food. If your puppy/dog is a "gulper," place a large object in the food dish, or buy a special feed dish that has a raised center. This forces them to take more time and smaller bites as they eat around the obstruction. Whatever object you place in their bowl it should be something that is too large to picked up in their mouths. Try a ping-pong ball for a cat, a baseball for a toy dog, a softball for a medium-size breed, and an even larger ball for large and giant breeds. In the beginning it may need to be a large heavy object or they will just push it out of the bowl. If you have more than one pet, feed them separately to reduce competition for food. I have used this trick with one of my more aggressive eaters, I scattered dry food over a large area of floor or on the grass, which forced him to spend time finding and eating each individual piece of food. 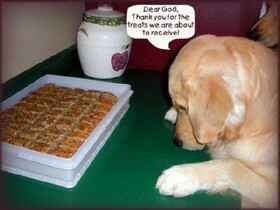 Dog Food and Treats can get expensive even with small ones like mine. The issue here is not so much the cost but what's in it! I've become very careful about this. Thad Tucker offers some interesting information on this subject, as well as over 60 Breakthrough Meals and Snack Recipes you can make at home. "Breakthrough Dog food Recipes Revealed"
Happy AND healthy is what I want, I chose them as special family members. I still give them lots of goodies, but now I make sure they're as Nutritious as possible. If your dog is experiencing medical problems you may need to look into his diet and make adjustments. I certainly don't want a vet bill, or Worse! And just because it's convenient isn't the best answer either.. Convenience, well eating fast food (McDonalds) every night is sure convenient for us two-leggers, but not exactly healthy!